Standing not much higher than an inch above the soil, this tiny golden brown toadstool really stood out against the bright green leaves all around it. So nearly finished! Now that I am on the last few rows I am confident that I will have my winter cardigan ready for Christmas. There is a ridiculous number of stitches on the needles, which is unavoidable when kitting the button bands and collar all in one go. I started off by using one circular needle, but it was all too crammed and I needed to buy another one and use them just as if they were two ordinary straight needles. This way I could lay the cardigan out flat and work out exactly where to place the buttonholes. Easy as pie - why did it take me so long to get round to making this? Probably because I was thinking I needed to make a specially shaped case for my camera, whereas a simple pouch does just as well. ...and on the inside the print fabric makes a surprise appearance every time. I have never been sure whether I like the colours of the print, but I love the pattern and it worked a treat as a guide for the quilting. As for the brown with cream flowers, that is probably one of the ugliest fabrics I have ever allowed in the house, yet somehow it works as the binding. And while I'm having a good moan, the green reminds me of the PE knickers we wore at primary school. In my mind's eye I am transported back to being eight again, when doorways were bigger. It's surprising how many unpromising elements can be brought together and work well. Here goes for Week 166. The project that caught my eye in Week 165 was Kerry's Provence quilt. If you haven't seen her Flickr page yet, nip over now and have a closer look. If you love free motion quilting, whether you are a beginner just taking the plunge, or you have reached the stage where you can do ostrich feathers with your eyes shut and still achieve perfect symmetry, then please link up. 1. 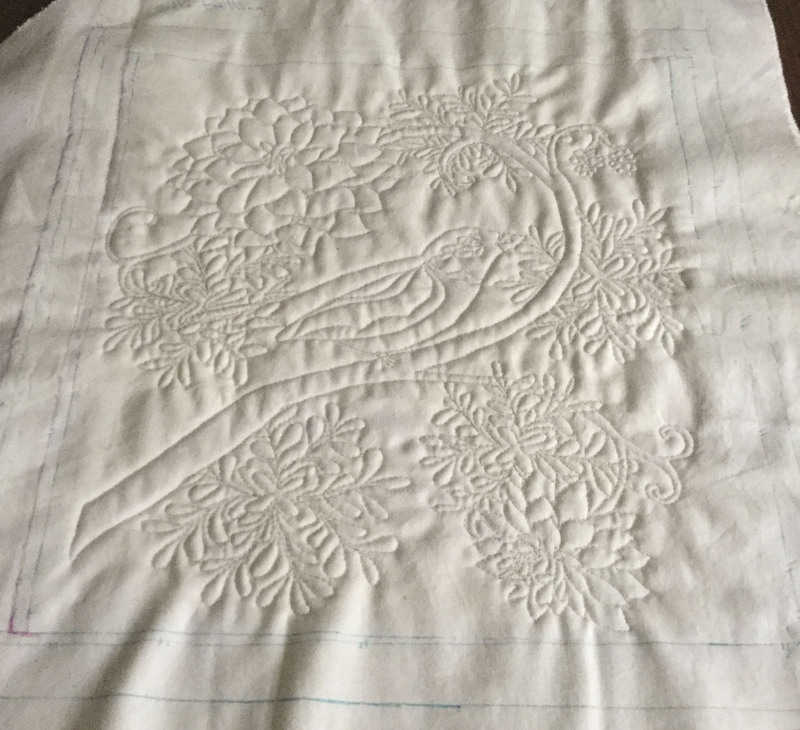 Link up with any recent post, ideally from the last week but within the last month, which features a free motion quilting project, whether it is a work in progress or a finish. 2. Link back to this post in your own post and/or grab the linky button for your blog's sidebar. 3. Visit as many of the other participants as possible and say hello in the comments box. 4. The link up will remain open for four days, from midnight to midnight GMT for the long weekend, Friday to Monday. 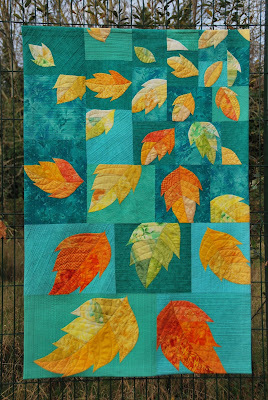 and Amanda Jean's blog Crazy Mom Quilts for Finish It Up Friday. Last week's palm tree is at the centre of the courtyard in the cloisters at Alicante cathedral, and on the wall beneath the arches is a beautiful tiled panel. This charming detail shows the traditional costume of Alicante, known as the traje de Alicantina. Totally sumptuous. Bring on the winter knitting challenge! I have enjoyed myself (so far) with this project. Not only is it the first item I have knitted for myself for over two decades, it has also amply demonstrated the rule that it is impossible to bust a stash without buying more. Mixing yarns is just as much fun as playing around with fabrics. The random yarn brought out the control freak in me. I wasn't convinced by the way four black stripes ended up bunched together in the ribbing at the front. The black is perhaps a little too black, looking smudgy like coal dust when you have had a careless moment making a fire. But I can live with it. Once the button band is on these stripes should blend in better. The plan when I started was to make set in sleeves and shoulder seams. Then I changed my mind and decided to do raglan shaping and knit the whole lot on a circular needle. I am really pleased with the way the stripes change direction with the shoulder shaping. Perhaps it will be finished by Christmas, but if not I should have it in plenty of time for February, which is often when winter finally decides to hit us. Ever noticed I'm a slow starter? For the third week running I am showing what I am going to do, but with zero progress. This afternoon I chose two strips of left over binding from the scraps tin, and decided that I am going to make a simple rectangular shaped pouch for my camera. But as for sewing... no, I'm still feeling far too sluggish as a result of the virus. All my energy has gone into knitting. And laundry. And other things far too tedious to mention. Here goes for Week 165. The project that caught my eye in Week 164 was Dione's strawberry quilt. If you haven't seen her blog post yet, nip over now and have a closer look. How can a palm tree look so much like a giant pineapple? This photo looks suspiciously like last week's photo, but with a slight difference. It is a picture of my new camera taken with my old one, as opposed to the other way round. My plans for making a camera cosy have come to nothing so far. I have been thwarted by a ghastly virus, which kept my husband off work for a week and has now worked its way across to me. Last Thursday in particular was a write off. Sewing is still far too complicated and strenuous a task to tackle, but knitting.... now, that's a different matter entirely. Thank goodness I have had a project to carry on with during all the hours I have been vegetating on the settee. Here goes for Week 164. The project that caught my eye in Week 163 was Janine Marie's Christmas tree. If you haven't seen her blog post yet, nip over now and have a closer look. Shapes and colours like coral on the branch of a dead tree. This is how I discovered that my new camera takes amazing close ups. Unable to resist a bargain, I pounced on a pack of end of dye-lot yarns at a local shop. The shopkeeper had very cannily teamed the random grey and maroon with a dark purple and a soft raspberry. Once I was home I fished the grey mohair out of my huge wool stash and thought for a few days about what I should make. Now I am well on the way making a cardigan. This is the first item I am knitting myself for years. Will it be ready to wrap up and surprise myself with at Christmas? Although I love random yarns, I can't help controlling them. They have a nasty habit of falling into solid blocks of colour, and arranging themselves differently according to the number of stitches in a row. Casting on and working the first two rows of rib in dark purple contains the random effect; also, because the purple is 100% acrylic and the grey random is slightly thinner and 75% acrylic and 25% wool, the purple will give a more hard wearing edge. The rib is worked on size 10 (3¼ quarter) needles. ...and the fluff being thrown mainly to the back. I am already dreaming up a matching hat. Or would that be too much? 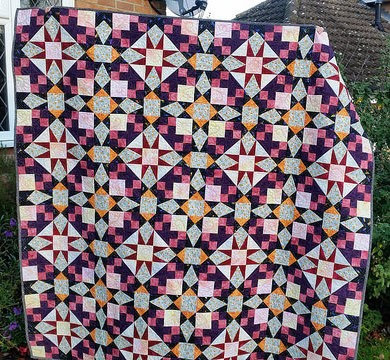 Only four and a half years half in the cupboard, and finally I have decided how to use this free motion quilting sample. The design looks fearfully clever, until you look at the back and find I was following a printed pattern. My husband has bought me a brand new camera, a slightly belated 30th anniversary present. After a few years of use and abuse (in particular, not keeping it in a case) my old camera is getting all slow and temperamental, so I now have the updated model. I have been trying it out and found it is much better at indoor shots in poor light (hooray! ), and it did the honours and took this photo of the old camera. Quite how I am going to shape the quilted case remains to be seen. I anticipate a bit of a tussle. Here goes for Week 163. 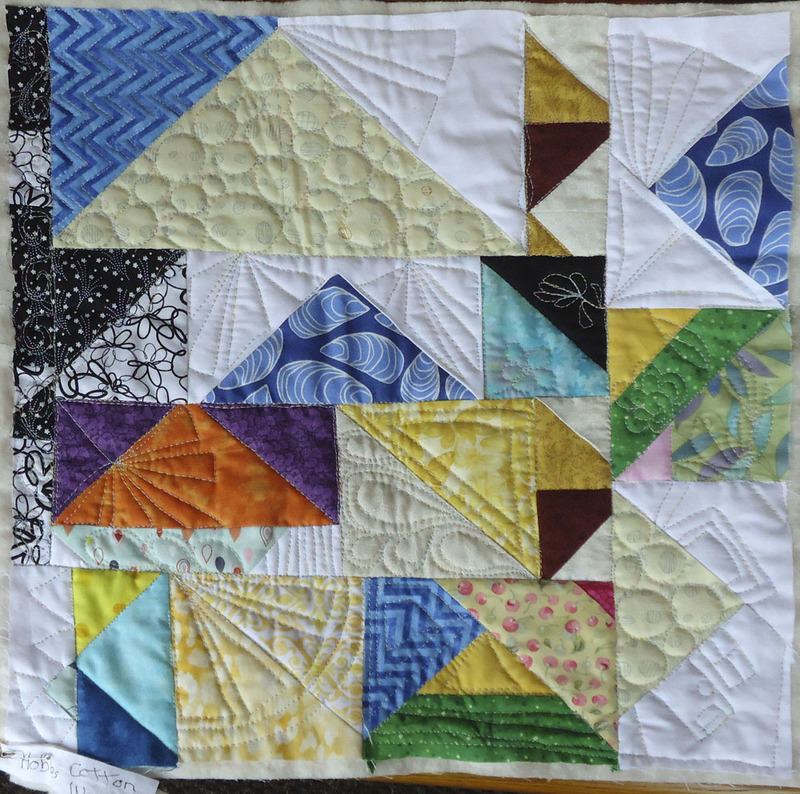 The project that caught my eye in Week 162 was Andrée's wholecloth quilt. If you haven't seen her blog post yet, nip over now and have a closer look. This egret was enjoying a paddle at the feet of a statue at the edge of the harbour in Alicante. Now that I have just returned from a quick holiday where I was surrounded by palm trees, I find this blanket particularly entertaining. I could quite easily get attached to this particular blanket, but I have to give it in to the church knitting group today so that it can be donated to a local hospital, where it will be given to a patient suffering from dementia. I have sewn on a few large buttons, which together with the palm trees are designed to keep restless hands busy. This palm tree has lost a coconut. I'm glad I wasn't sitting under it at the time. Just last week I had the novel experience of just missing being hit by falling dates. The sparrows above me were having a feast and didn't care who got pelted. Under pressure, that's seems to be the only way I get these landscapes done. The deadline I had for delivering the quilt was Monday, and I finished the sewing at about midday. Then had breakfast. Then got dressed. Then pressed the picture flat and trimmed the edges off. Then jumped in the car to drive to Midsomer Quilting, and arrived there some time before 3 o'clock. The annual exhibition of 12 x 12 quilts runs from 24th November to 18th December, and I had a sneaky preview of a couple of the other quilts. It is going to be a fascinating exhibition! This year's theme is "Where in the World? ", and having stayed so close to home with my own entry, I am looking forward to seeing where all the other exhibitors take us. With all the rush on Monday, I didn't get the chance to take decent photos, so until I get the quilt back, here is a detail. The trademark three birds have made their usual appearance, and the sky has to be the fastest one I have ever stitched. This landscape turned out better than I had hoped, and I have tried out a few new techniques, which made a great difference. Next month I shall take close up photos and show how the colours came together. Here goes for Week 162. The project that caught my eye in Week 161 was Janine Marie's quilt for Vegas. If you haven't seen her blog post yet, nip over now and have a closer look. Why do I never take pictures of the sunrise at home? Two reasons; firstly, the sun rises behind a hill and can't be seen from our house; secondly, I am invariably tucked up in bed and oblivious to the whole thing anyway. Last week I was away with my brother in Spain and had the great delight of seeing the sun rise over the Mediterranean. The fact that it is November, and that Spanish clocks are set an hour ahead, really helped. I didn't have to crawl out of bed too early. Only a few hours' work left, which is just as well because I have a deadline. There has been very little progress since last week because I have had a trip away with my brother, and getting back into the groove has been a bit of an effort. I need to deliver this landscape to Midsomer Quilting this weekend for the annual 12 x 12 exhibition, so tomorrow I hope to have it all but finished. The sky will be fairly straightforward, just plain with a few hand-stitched birds, but the trees could be a bit of a tussle. Then I will have the fun and games of ironing it flat when it is done. Why do I leave everything until the last minute? I knew the theme for this year's exhibition almost a year ago. Here goes for Week 161. 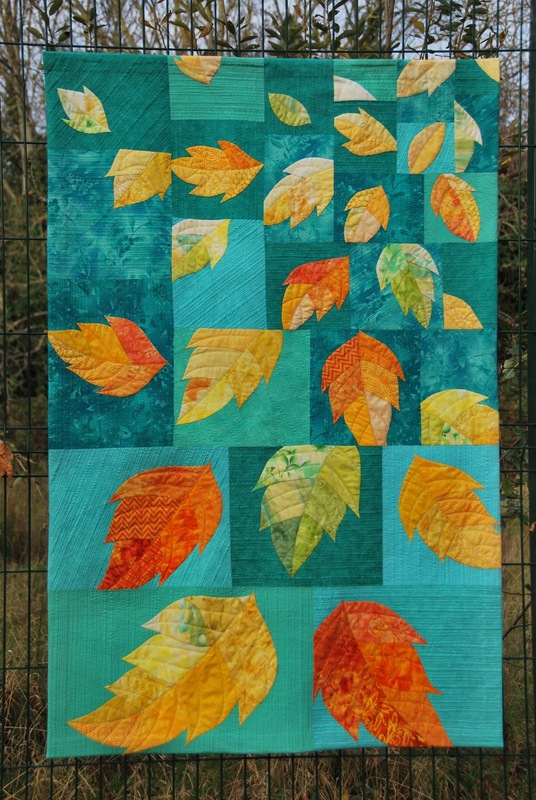 The project that caught my eye in Week 160 was Olena's autumn leaves quilt. If you haven't seen her blog post yet, nip over now and have a closer look. Having followed the photo slavishly until now, linking the foreground of the landscape to the background calls for a slightly different approach. There is a fair amount of scribbling involved. The danger lies in getting carried away, so I add a little bit at a time, with frequent breaks to hang it up and see how it looks from the opposite side of the room. Here goes for Week 160. The project that caught my eye in Week 159 were Andrée's test pieces, comparing different waddings. If you haven't seen her blog post yet, nip over now and have a closer look. Slowly the landscape is taking shape. I have worn a groove in the floor walking back and forth between the sewing machine and the computer screen checking the photo of the crop of rapeseed. Getting the position of the tractor tracks through the crop was crucial for the perspective. In theory, all I have to do now is the equivalent of colouring in, except that it is not quite so simple. Today I have had a day off because there are a few problems to overcome. The degree of puckering is a little irksome, but that will rectify itself as I fill in the gaps. How I am going to stitch the rapeseed in the foreground remains to be seen. What bothers me most is that I have put too much yellow in the thin strip of rapeseed in the centre. I shall either have to stitch over it in a lighter shade, and/or intensify the yellow slightly on either side of it. Sometimes I think life would be far easier if I just learnt how to paint in watercolours, but that would rather defeat the whole object of the exercise. So I keep on sewing. Here goes for Week 159. The project that caught my eye in Week 158 was Jocelyn's Sew Spooky hanging. If you haven't seen her blog post yet, nip over now and have a closer look.